‘Carousel’ was just the brand name of this toy keyboard, it didn’t unfortunately look like a carousel . . .
. . . but having just finished the Animal Band and The Telephone, I wanted, while it was in my mind, to work on another device that could be controlled by the Bigfoot, only this time with a full two octave span, the ability to play a variety of different scales, and be tuned to play these scales in any key. I opened up the Carousel, and it looked as though it would fit the bill. 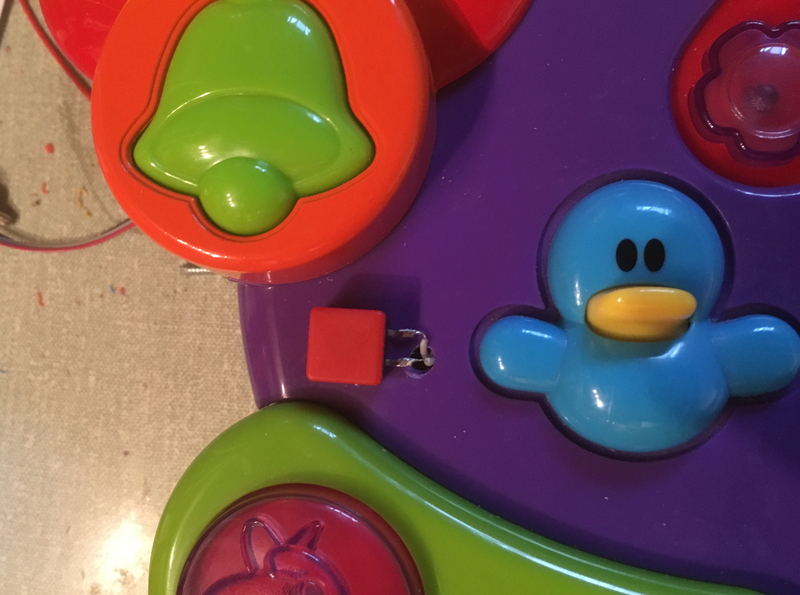 The chip on which it was based was securely hidden under a black blob, but there were sufficient additional components to make me think a few simple hacks would be possible. First of all, I wanted to check the instrument’s ability to be tuned. 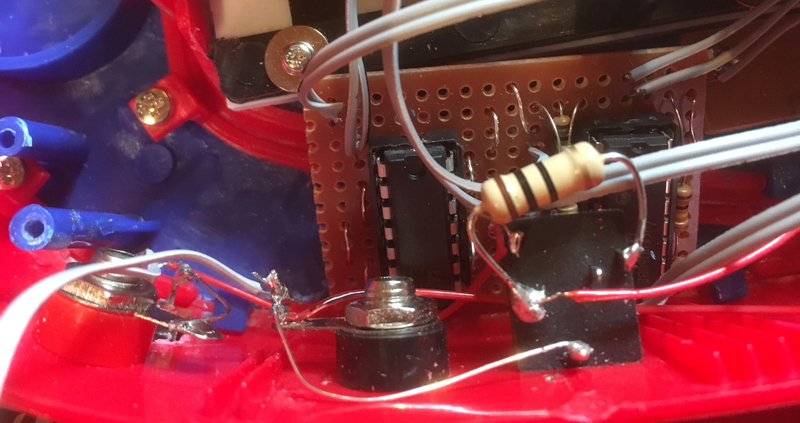 I inserted batteries, switched on and began testing the circuit using the traditional wetted finger method – that is, starting the instrument playing one of its demo tunes and applying a wetted fingertip to different resistors on the board. 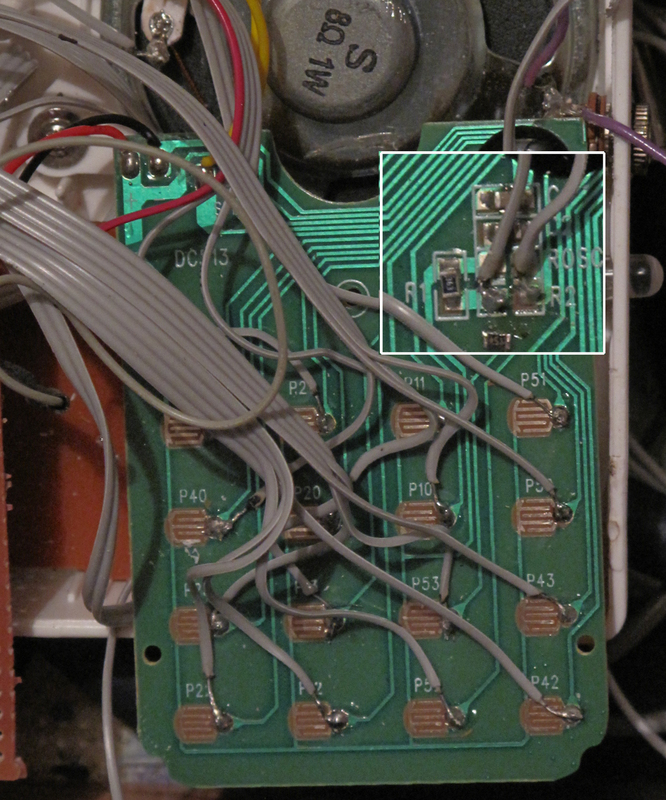 (Also visible in the background are the wires connected to the PCB tracks required to trigger the notes). I experimented with the resistance and found that the minimum the device would accept without crashing was about 200k, so I added an extra couple of 100k resistors before the 1M potentiometer, and found that a considerable variation in the pitch was achievable. Early on in this process I disconnected the internal speaker, which was quite terrible, and added my standard 4mm banana sockets for attaching an external speaker. The sound was 100% improved, and experimenting became a great deal more pleasurable. Just beneath the speaker sockets a switch can be seen, which I connected up to allow the internal speaker to be selected, if an external speaker wasn’t available. I later added an audio out socket, to allow the Carousel Keyboard to be played through the Taurus amplifier. 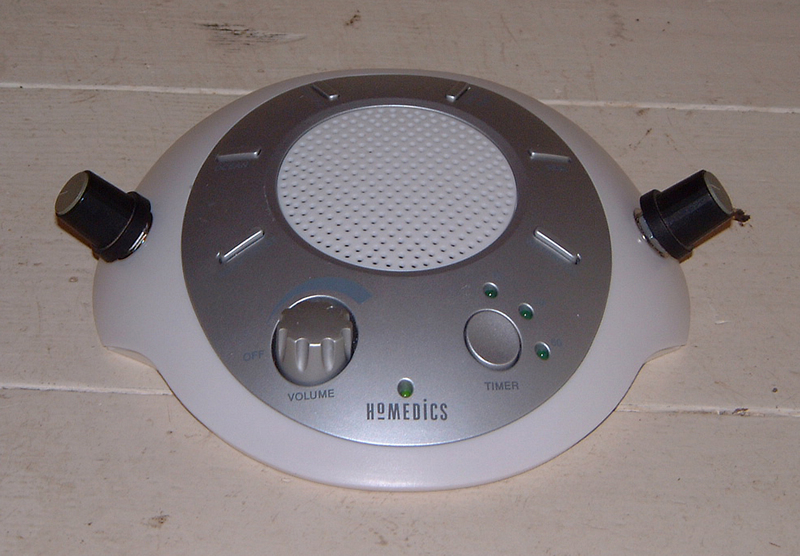 At first this didn’t work at all – virtually no sound came out, even though it would work with the internal or external speakers. But I realised the output of the circuit needed a load in place of the speaker, so I put a 10 ohm resistor between the audio out and ground pins on the audio out socket, and after that it worked fine with an external amplifier. I was saved from having to do the job I had performed on the Animal Band and The Telephone, working out which PCB tracks needed to be connected to produce the different notes: to my surprise, this was printed on the back of the circuit board. There appeared to be an 8 x 5 matrix, so connections were made to the relevant PCB tracks, ready to be brought out to a new board. The intention was to be able to control the keyboard with the Bigfoot sequencer, so I added a 5-pin DIN socket and 4050 buffer, as usual, ready to accept the Bigfoot’s 4-bit binary input. This is in the form A B C D, where A is the last – rightmost – bit in the binary number, and D is the leftmost. A is sometimes referred to as the LSB (Least Significant Bit) and D the MSB (Most Significant Bit). The binary number 0010, for example (the number 2) would mean that D was 0, C was 0, B was 1 and A was 0; in practical terms this means that input D was 0v, C was 0v, B was +v and A was 0v. I needed one of the inputs (D) to be inverted – i.e. if the input was 0v, I needed +v, and if the input was +v, I needed 0v – so with the 4050 was a 40106 inverter, with sections which change 0v to +v and +v to 0v. There was very little space inside the keyboard case, so the board with the 4050 and 40106 was tucked under the output socket. (This was before I added the 10 ohm resistor on the socket). There are 6 buffers in the 4050 chip; 4 of these are used (marked A B C D) and the inputs of the other two are connected to ground. Likewise, there are 6 inverters in the 40106; 1 of these is used and the inputs of the other 5 are connected to ground. Unused inputs on CMOS chips should normally be grounded like this to ensure correct operation. Normally, I would use a 4067 to cover the two octaves produced by the Bigfoot – as in the Animal Band and The Telephone – but in this case that wouldn’t work. The 4067 is essentially a 16-way switch with a single pole; in this case there were 4 different ‘poles’ to which connections needed to be made, since the notes are produced by a matrix. Using four 4067’s would be perfectly possible, but unnecessarily expensive – each one costs between 30 and 50p, and is physically quite large, being in 24 pin wide format. As there would only be 4 or 5 connections to each pole, it would be more effective in terms of cost and space in this circuit to use 4051’s. 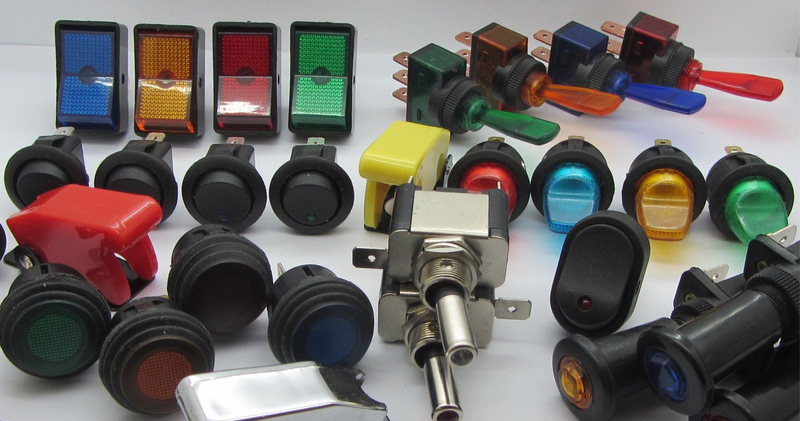 The 4051 is an 8 pole switch which works in more or less exactly the same way as the 4067, but is physically smaller – and costs less than 15p! An important difference between the 4051 and the 4067 – related to the number of outputs – is that the 4067 requires a 4-bit binary input (16 numbers, from 0000 to 1111), but the 4051 only a 3-bit (8 numbers from 000 to 111). This means that a different way must be found with the 4051’s to ensure that outputs for the first 8 numbers are separate from the outputs for the second 8 numbers. This can be done by using the Enable/Inhibit pins of the 4051’s. 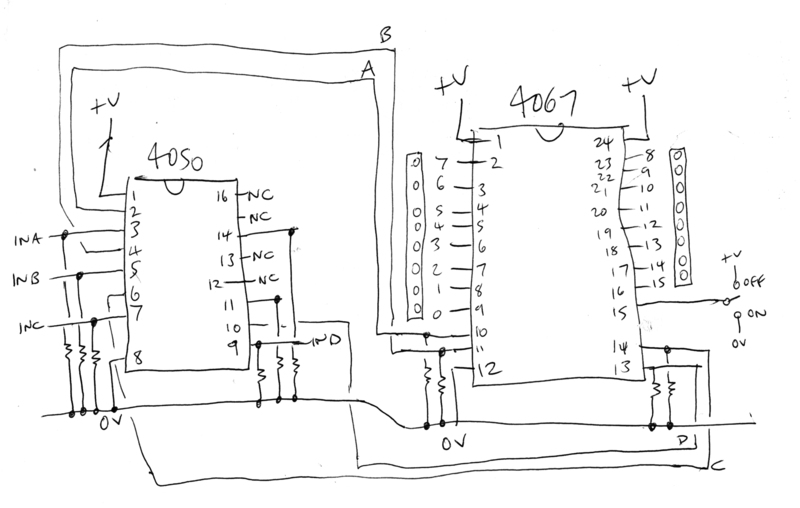 Each 4051 – just like the 4067, in fact – has an Enable/Inhibit pin: if this pin is at 0v, the chip will work, and convert its binary inputs into individual outputs; if the pin is at +v, it won’t work. 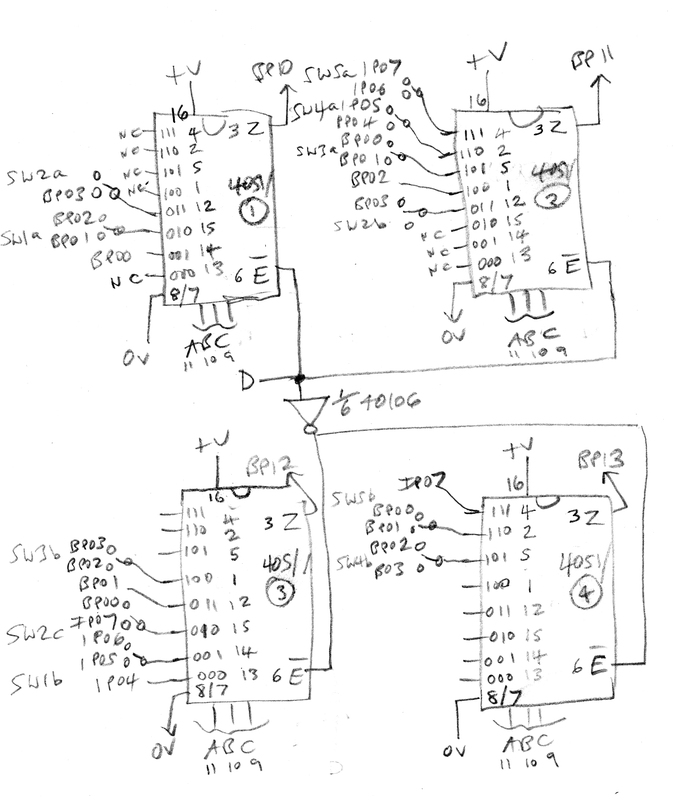 So, the first 3 inputs from the Bigfoot binary input socket, A B & C, are passed on to the 4051’s in the next part of the circuit, but the 4th input, D, is not. Instead, the 4th digit is used to turn pairs of the 4051’s off and on via their Enable/Inhibit pins. 4051’s 1 & 2 output the lower 8 numbers (0000 to 0111), so as long as the 4th, leftmost, digit is ‘0’, these two 4051’s are enabled. 0v at the Enable/Inhibit pin achieves this. 4051’s 3 & 4 output the higher 8 numbers (1000 to 1111), so if the 4th digit is ‘1’, an inverted signal from the 40106 sends 0v to enable these two. 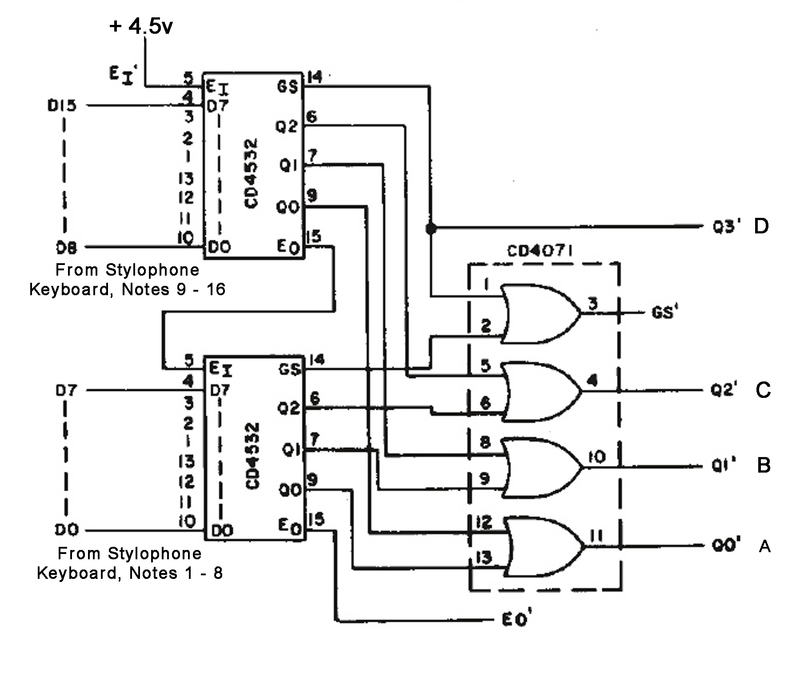 The lower 8 notes are divided between the top two 4051’s in the diagram, which work together with no overlap in notes, and the higher 8 notes are divided similarly between the bottom two, according to which common pin they must connect to. The pin connections are named in the diagram as they appear printed on the keyboard’s main PCB: the 4 common pins are connected to tracks named BP10, BP11, BP12 and BP13. 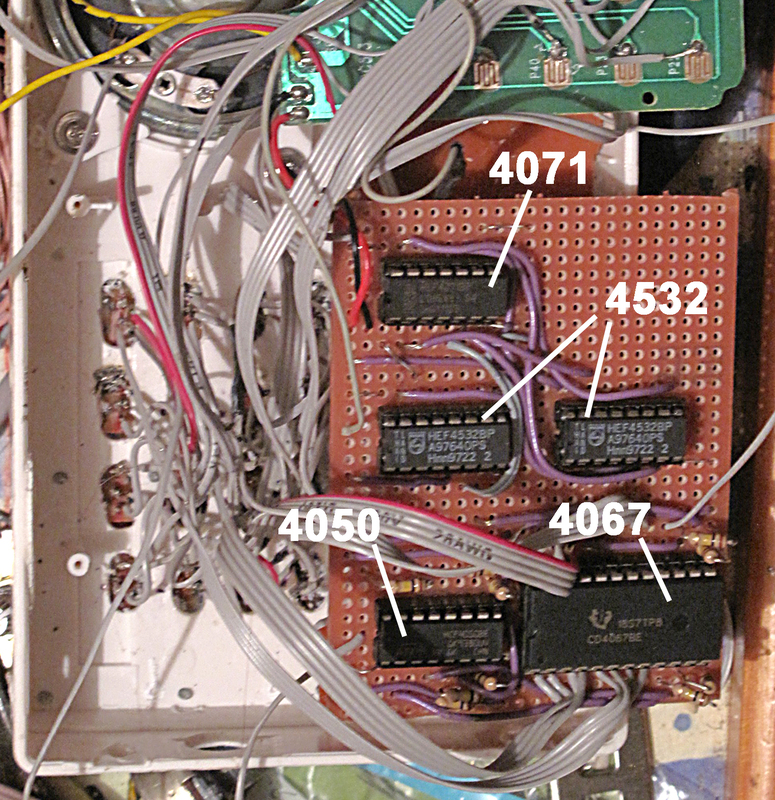 The reason there are many more than 16 output pins shown is connected with the principle of the Bigfoot sequencer. The idea is that the sequencer outputs the notes of a scale – do, re, mi, fa, so, la, ti, do – but the exact scale – major, minor, melodic, harmonic, etc. 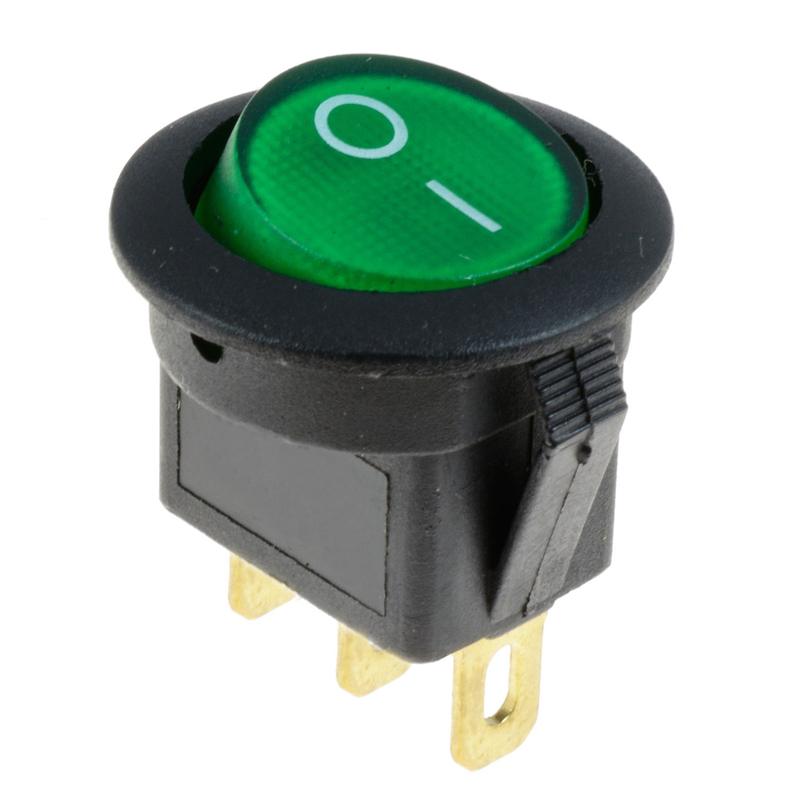 – is determined by switches on the receiving instrument. Normally there would be 5 double pole switches, but due to the configuration of the pins in the Carousel keyboard, one of the switches (SW2) needs to have 3 poles. There was just enough room for the new circuit board with the four 4051’s on it. 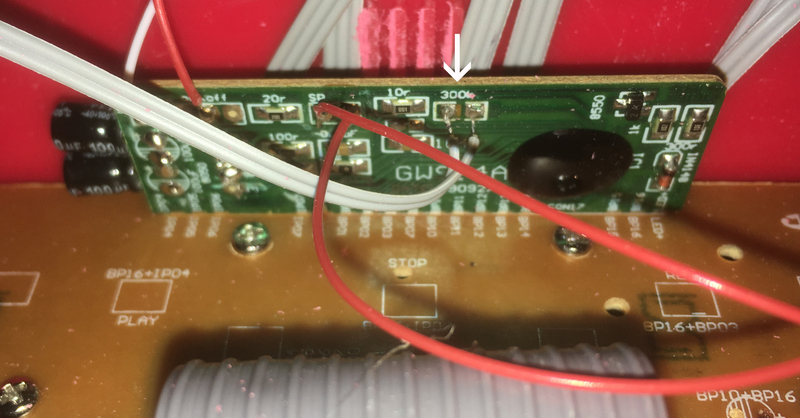 The Chessboard Keyboard proved very useful in checking that everything was working properly – one wrong note revealed a connection error on one of the switches! 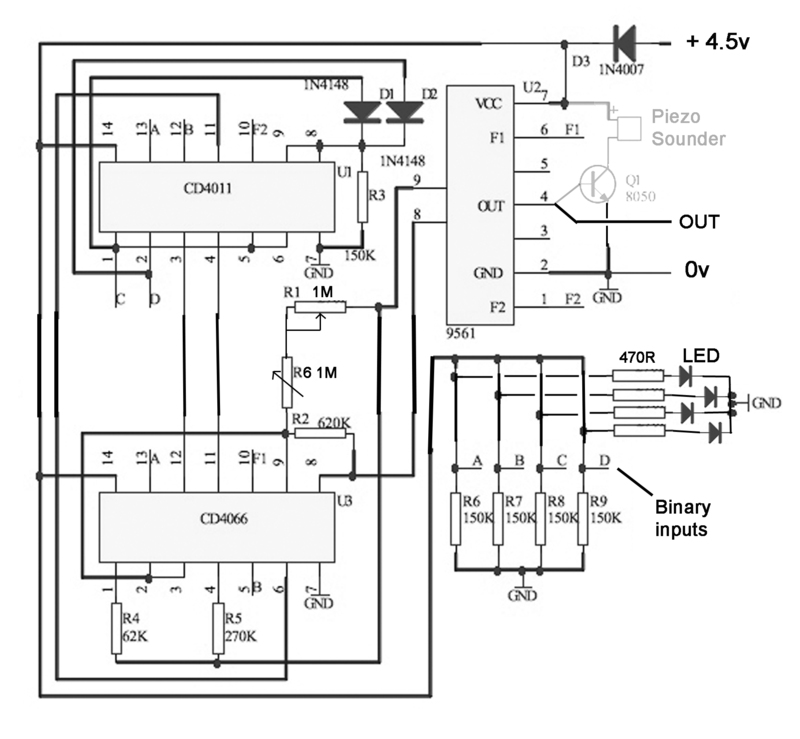 – and the 4 LEDs were a good double check that the binary input was being interpreted correctly. 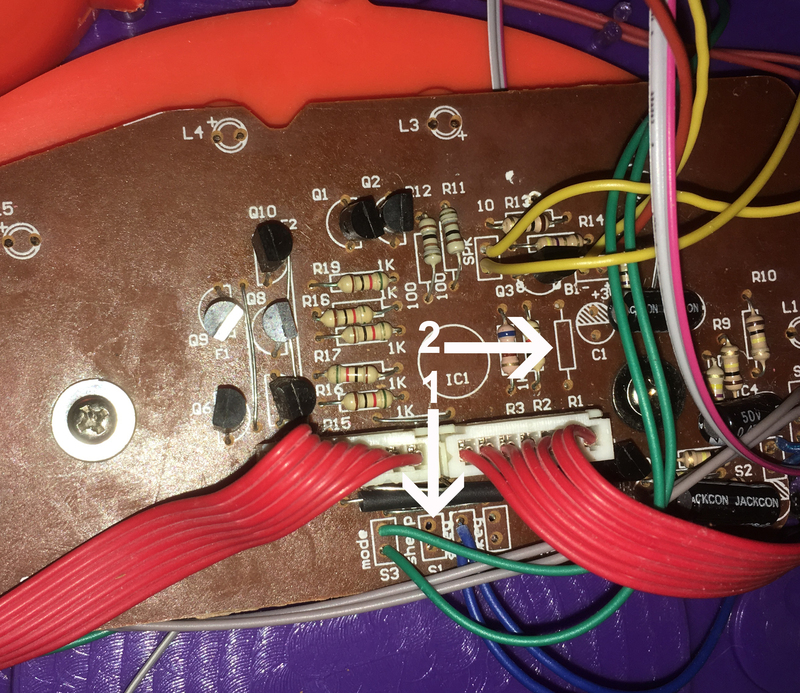 Although the pitch control potentiometer worked well, I decided there was a need to be more precise about the pitch, which would effectively set the key the instrument would be playing in when controlled by Bigfoot. So, as I had done earlier with The Telephone – referred to above – I added a switch to change between the potentiometer and a 12-way switch. 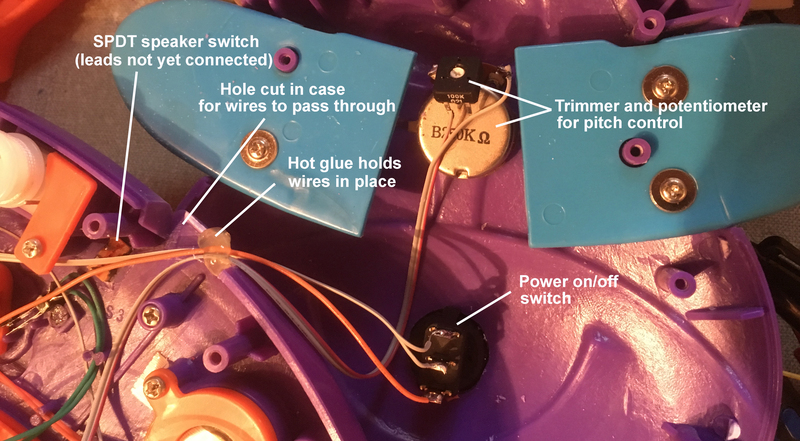 Between each of the output pins of the switch, I inserted a 100k trimmer – with an extra 100k trimmer before pin 1 – so that the pitch of the instrument could be set to any one of the 12 steps in the octave. In The Telephone I used ordinary single-turn trimmers, but I though it would be a good test to see if multi-turn trimmers would be as good – that is, as accurate in establishing the pitch, remaining in pitch, and not taking up too much space in the cramped enclosure. Buying 20 at a time enabled me to get them at a reasonable price – about 8p each, although this was probably twice as much the single-turn trimmers I had used in The Telephone. They were also much more than twice as big. However, I soldered them all in place and set about adjusting the pitches. In this instance, I didn’t really find a big advantage in using the multi-turn trimmers. I was tuning the pitches by ear – maybe I was able to be more accurate than with the single-turn trimmers, maybe not. It took longer to tune each note, of course, because of the number of extra turns required. I would have been glad if the potentiometer/trimmer arrangement had been a bit smaller, but I found space on the right-hand side of the keyboard to fit it in with the potentiometer and the other switch. 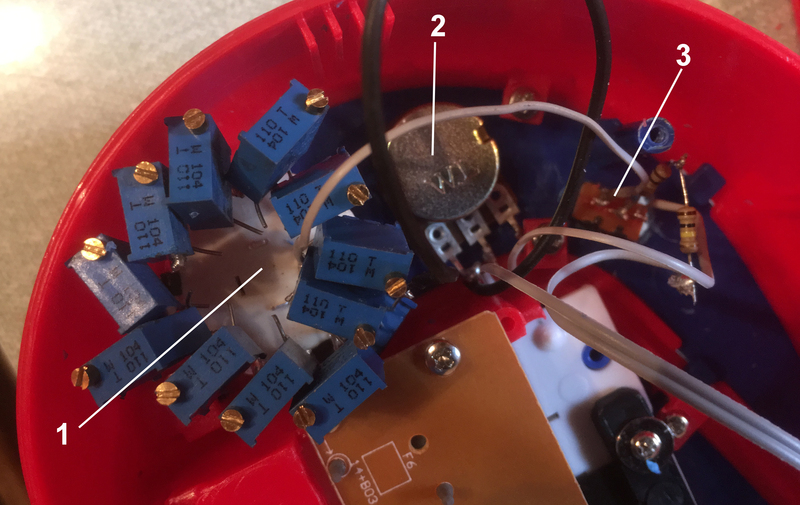 This picture shows 1 – the 12-way switch with trimmers, 2- the 1M potentiometer, and 3 – the SPDT switch which allows either the 12-way switch or the potentiometer to be selected. I chose two knobs which fitted the space available on the top surface, drilled holes and fixed them in place. That was everything I planned to do with the Carousel keyboard for now, so I carefully closed up the case and screwed it back together. I had to cut some rectangular holes in the base to make room for the 5 switches, but surprisingly everything else fitted in. The idea for the StyloSound came to me when, at about the same time, I acquired two small sound effect devices. One was a ‘Sound Machine’, a small hand-held unit with 16 push-buttons, the other was a Sound effect kit with PCB, also with 16 different sounds. 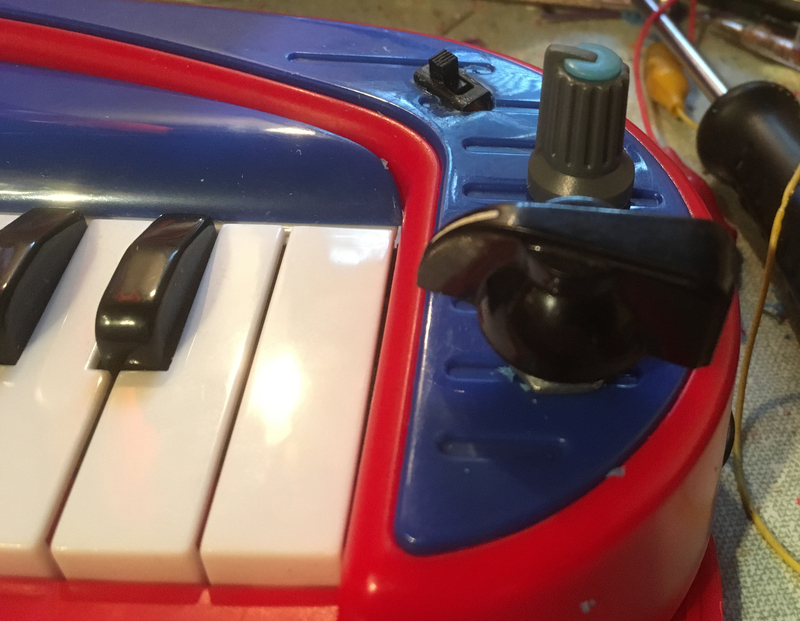 I thought it would be a good idea to combine the two things into one unit and use the Stylophone stylus to trigger the sounds; plus I was also working on devices to interact with the ‘Bigfoot’ trigger/sequencer, so I decided to add the capability for the sounds to be triggered by the Bigfoot’s 4-bit binary output. 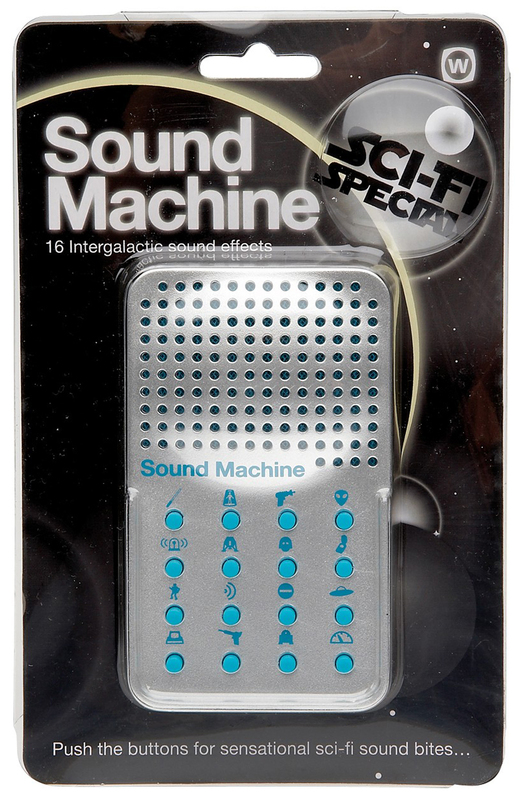 There are several varieties of Sound Machine. The one I got was the silver ‘SciFi’ version. This has a number of interesting ‘spacey’ effects, some of which I recognised from Star Wars, Close Encounters and others; some I didn’t. These Sound Machines aren’t all exactly the same inside, apparently (this site gives a very good first-hand account of looking inside them: http://www.magicmess.co.uk/cb/sm.php)*, but I guess the sounds are all initiated the same way – a +V pulse into the appropriate input of the dedicated chip which stores the samples. *[Edit: unfortunately, this site is no longer up; I saved some of it, which had this information in it: http-www-magicmess-co-ukcbsm-php.pdf]. 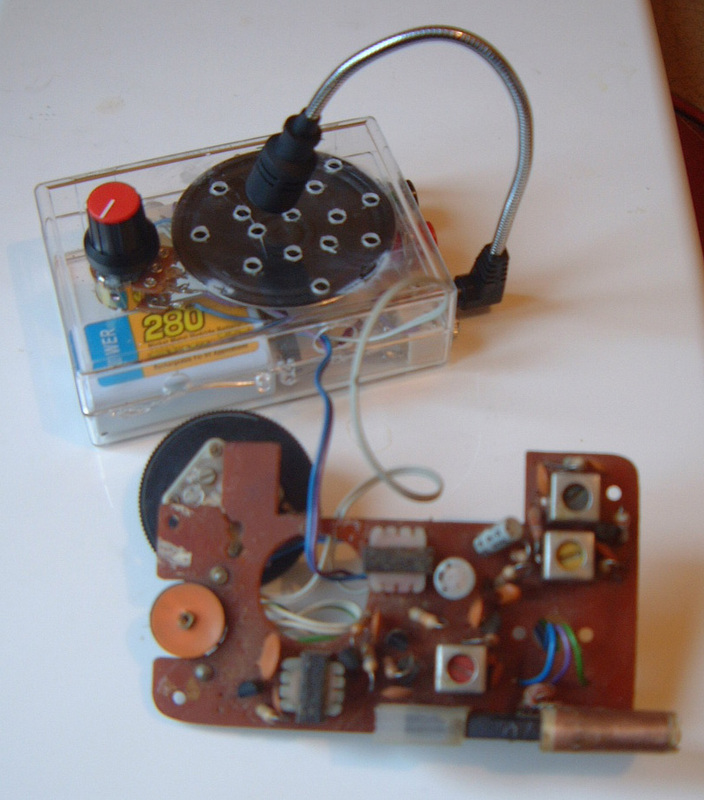 The Stylophone stylus was connected to +V, and the output from the Sound Machine PCB went to the Stylophone speaker, which was much better than the small speaker in the original. 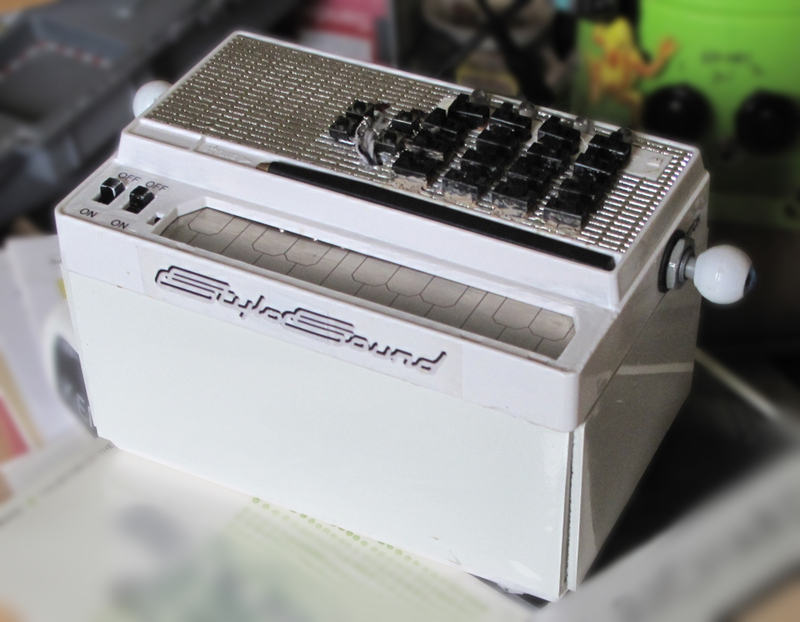 The Sound Machine is powered by three small 1.5v button cells, so it was no problem to use the Stylophone’s own battery compartment, which takes three AA batteries. 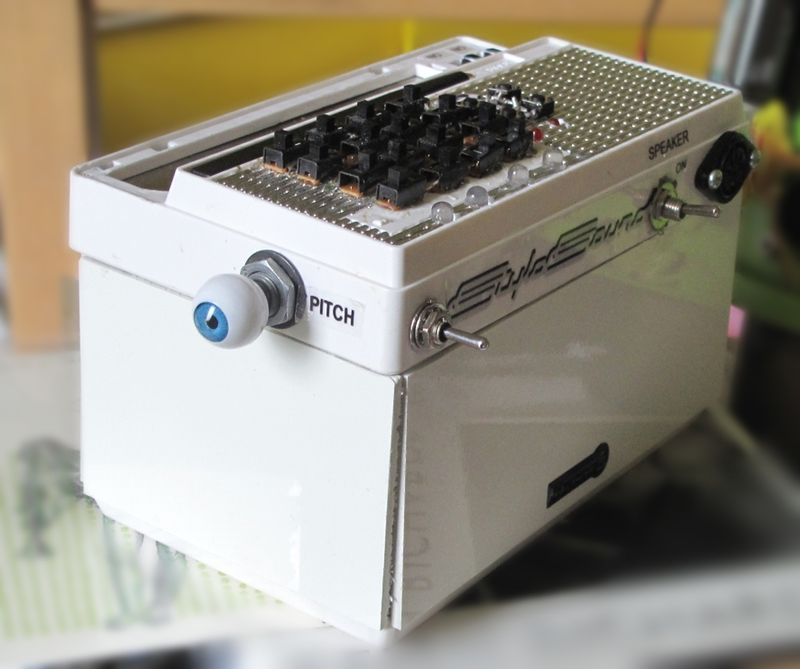 With all the switches to the left, the Sound Machine PCB was selected, and it was possible to play all 16 sounds from the Stylophone keyboard. It was clearer from this than using the original buttons that each sound has to play right through before a new one can be selected. The next obvious step was to interfere with the playback speed of the sample. 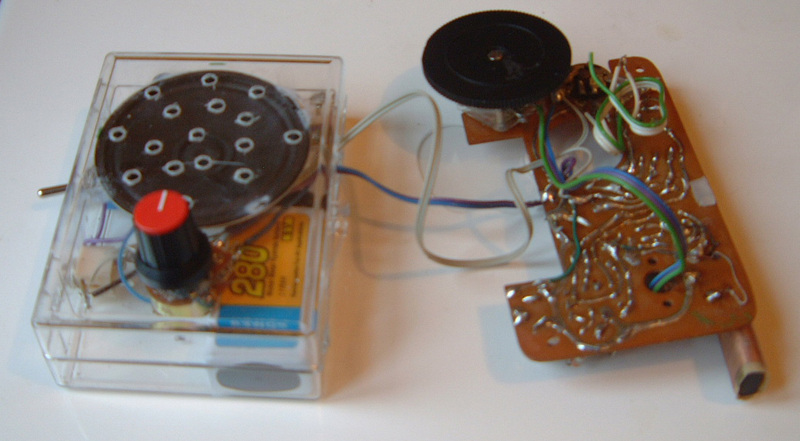 This version of the Sound Machine has only four visible components, two resistors and two capacitors – all tiny SMD (surface-mount) type – with the main chip embedded in its plastic blob. Using the wetted finger method, I found the resistor responsible for playback speed, which is marked ‘R2’. I removed it and replaced it with a potentiometer, which slowed down and speeded up the playback. Unusually in my experience, the chip reacted badly to both too low a resistance and too high, and a 1M potentiometer, my usual first choice, was too big for it, causing it to crash. In the end, I settled on a 470K potentiometer with 100k trimmers either side. When the trimmers had been adjusted, this seemed to keep the resistance within acceptable levels. (Later, I read the website referenced above, and the writer had a different solution to this problem, but I didn’t have time to check it out). The two logic chips are a 4066 (quad analog SPST switch), and 4011, (quad 2-input NAND gate); the sound effect chip was on a separate board, inserted, strangely, at right angles to the main board in the slot on the right. The 4 SPDT switches enable the sound to be selected manually – the input is 4 bit binary – as an alternative to the 4 inputs on the left-hand side of the board. Output is through what looked like a small piezo element (the round black component in the bottom left of the picture). Some of these interpretations are rather fanciful, but that was no problem as I was more interested in making noise than repeating recognisable sounds. This chart – for a similar chip in the series – gives some idea of the variations in binary inputs, combinations of selection inputs and resistances that produce different sounds. If you read Chinese, which I don’t, it probably tells you in the right-hand column what sounds these combinations make. The PCB was robustly constructed and I put it together omitting the four slide switches, as I intended to control it externally, and didn’t attach the piezo sounder, which wasn’t going to be used. 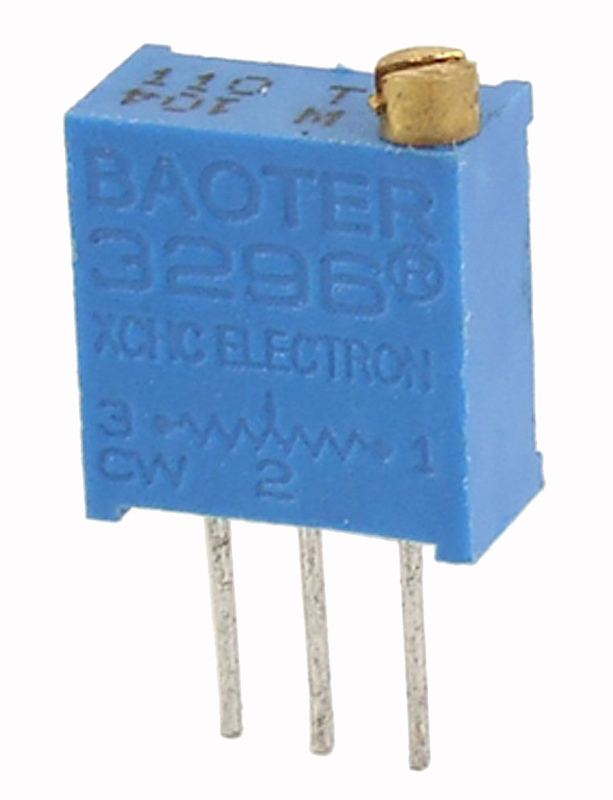 Several of the resistors, when tested, had an effect on the pitch and speed of the sounds – the main job of the 4066 and 4011 is to select different combinations of resistors to affect the sound produced, much as indicated in the chart above – so I picked the likeliest one and replaced it with a 1M potentiometer. This seemed to do the trick – perhaps taking things slightly too far in the upper direction, so I added a preset in series to keep it from going to its maximum – although it had happily done this without any danger of crashing the chip. I only had a log potentiometer available, and in the end this was quite fortunate. I found that connecting it the opposite way round from what would be expected – i.e. turning it clockwise decreased the pitch and speed, rather than increasing it – exploited the logarithmic scale well, making a much slower and smoother transition through the higher pitches and speeds. I could have bought an ‘anti-log’ pot, but additional time and expense didn’t seem worth it. This was a timely reminder that a useful part of experimentation would be to compare lin and log pots in particular situations, and reversing the log ones to see what difference this produced. (Reversing the linear ones would, of course, do no good, as they progress evenly through the scale from top to bottom, whichever way round they are). 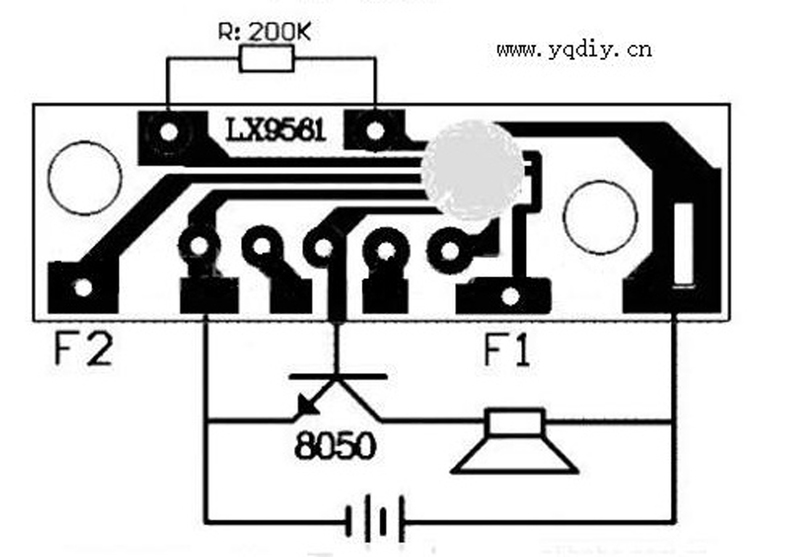 The original circuit diagram was provided by the supplier, Chip_Partner_Store, a Chinese company with an eBay shop at http://stores.ebay.com/Chip-Partner-Store. Places like this – and there are many of them on eBay – are great for browsing through: you can find great deals on bulk buys of common components, as well as somewhat more unusual ones at very reasonable prices, and odd chips and modules like this one, which could always come in handy. I’ve indicated in the diagram where I added the 1M potentiometer and preset, plus four LEDs, connected, via 470Ω resistors, to the A B C D inputs, the other ends connected to ground. These were not there for any reason, particularly, except as an indicator of the code being received – and on the principle established with Bigfoot that flashing lights are always good. I was sceptical as to whether the circuit supplying the four inputs would be able to power these as well as operate the Sound effect module correctly, but it all seemed OK. The greyed-out section at the output wasn’t used in the final circuit. Actually, this unit begins sounding repeatedly as soon as power is connected to it, since the default input 0 0 0 0 has an associated output – ‘Machine gun voice’ – and I couldn’t find a way of stopping it, so I also added a power on/off switch to this board, which isn’t shown, in case this feature became annoying. SInce the circuit has four binary inputs, and I wanted to control the unit with the Bigfoot, which has a 4-bit binary output, it would seem logical to connect the Bigfoot output directly to the A B C D inputs. Unfortunately, this wouldn’t allow the Sound effect module to be operated by the Stylophone keyboard, or the Bigfoot to control the Sound Machine, so additional circuitry was needed to convert the binary input into 16 individual outputs, and then convert that back into binary . . . The input from the 5-pin DIN socket goes first to a 4050 hex buffer. Four of the six buffers are used. The reason for doing this is to exploit an unusual and very useful feature which the 4050 shares with its more common sibling, the 4049. Both perform a similar function, but the 4049 inverts the input (high level voltage in = low level voltage out, low level voltage in = high level voltage out), and the 4050 doesn’t. What both of them are able to do is accept an input voltage level higher than the supply voltage, a vital consideration here as the output from Bigfoot is at 9v, whereas the circuitry of the StyloSound is at only 4.5v. 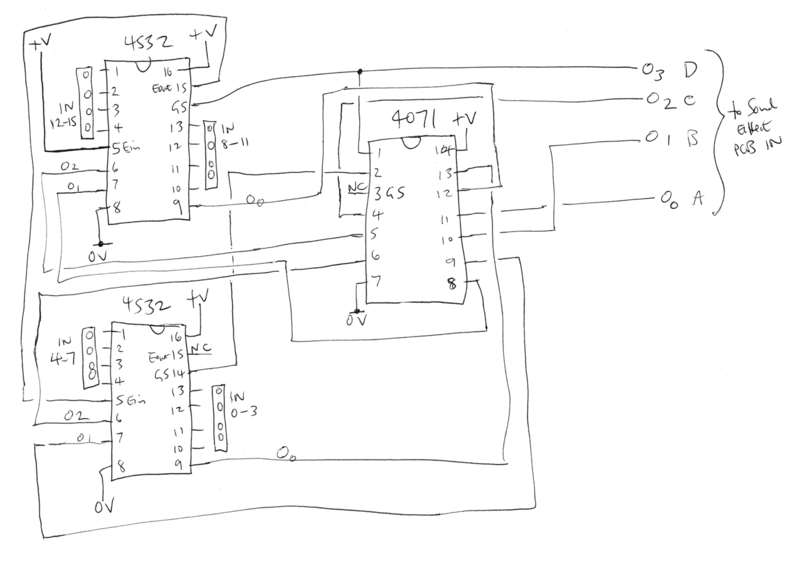 The 4050 is able to acccept the 9v input from Bigfoot and safely reduce it to 4.5v for the other circuits. 9v isn’t a problem for CMOS chips, but the Sound Machine and the Sound effects module are both rated at 4.5 – maybe 5 or 6 maximum – volts. The four outputs of the 4050 go into the A B C D inputs of the 4067. 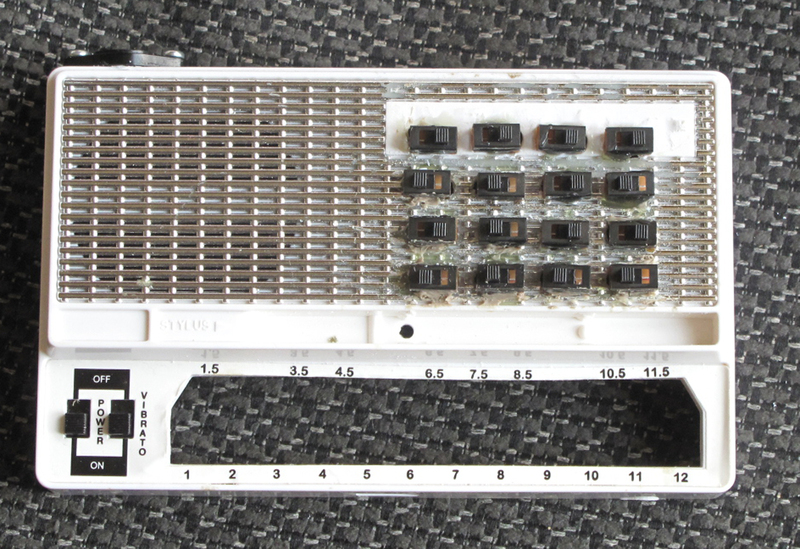 Each of the 16 outputs of the 4067 goes to the pole of one of the SPDT switches described earlier. According to the binary coding on the inputs, one of the 16 outputs of the 4067 is connected to +V, and this signal is sent in the direction either of the Sound Machine when the switch is to the left, or the Sound effect module when it’s to the right. 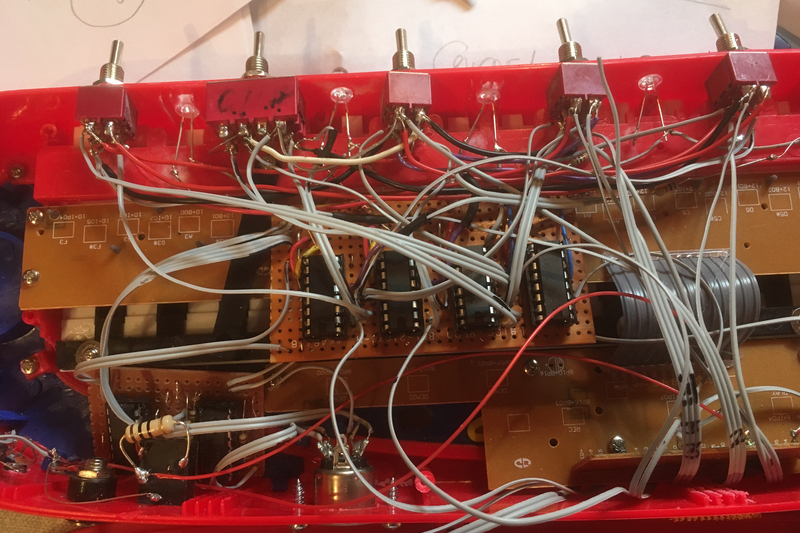 The Sound Machine has 16 separate inputs, so no further circuitry was required: each switch was connected to one of the 16 places on the Sound Machine PCB where there used to be buttons. For this signal to operate the Sound effect module, however, it needed to be changed back into binary. 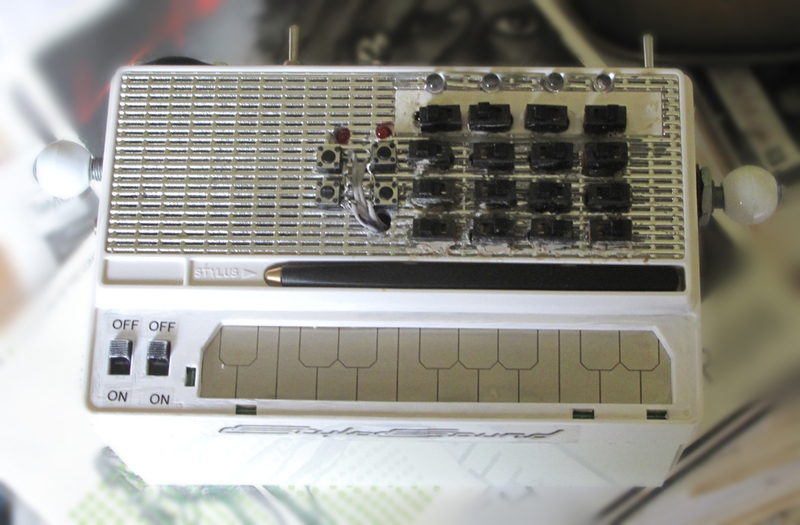 The 16 inputs marked ‘From Stylophone Keyboard’ were all connected to ground with 100k resistors so that each one would be at 0v if not receiving a +V signal from the keyboard or the 4067. The outputs of the 4071 were connected to the Sound effects module where marked A B C D in the earlier diagram. 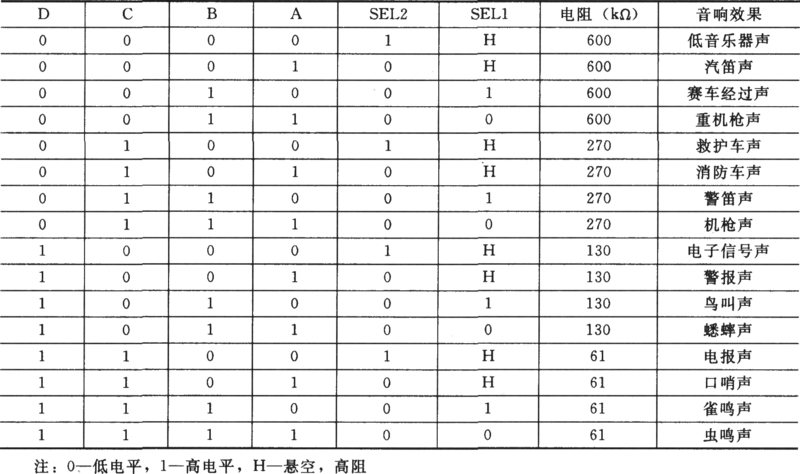 I’m not entirely sure that the correct order of those 16 inputs is as implied in the datasheet circuit. Since I had LEDs on the inputs of the Sound effects module – i.e. effectively at the outputs of the 4071, I was able to check the sequence, and I found myself swapping some of them around. If you’re using this method of converting single outputs to binary, it would be advisable to check this as you go along. In my case, the wiring to and from the SPST switches was such a bird’s nest, that it became too difficult to work this out. If it becomes clearer when I use this system in future projects, I’ll make sure to record the correct sequence. 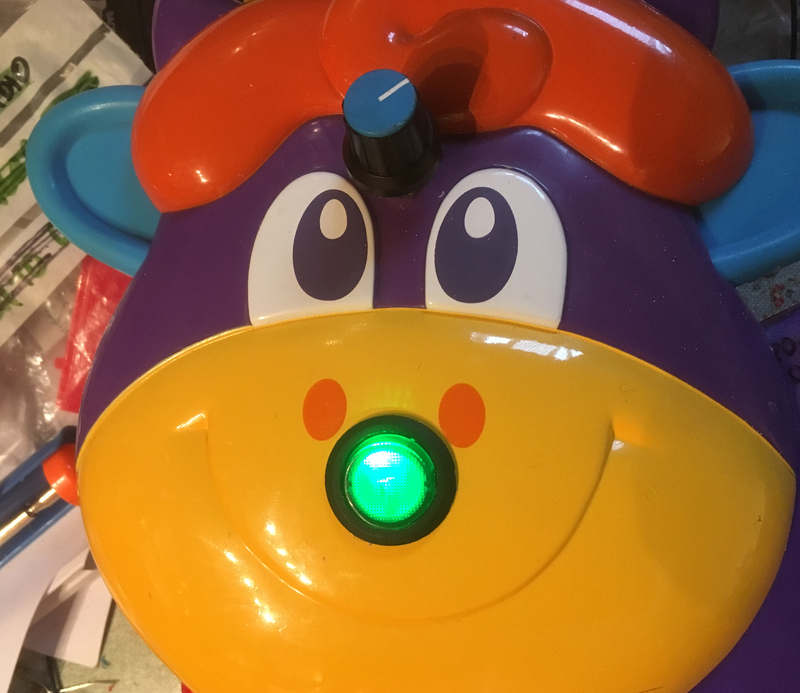 However, when tested with ‘Bigfoot’, the module was triggered accurately, and the LEDs on the input lit up with the correct numbers when the notes were tested with the stylus and keyboard. 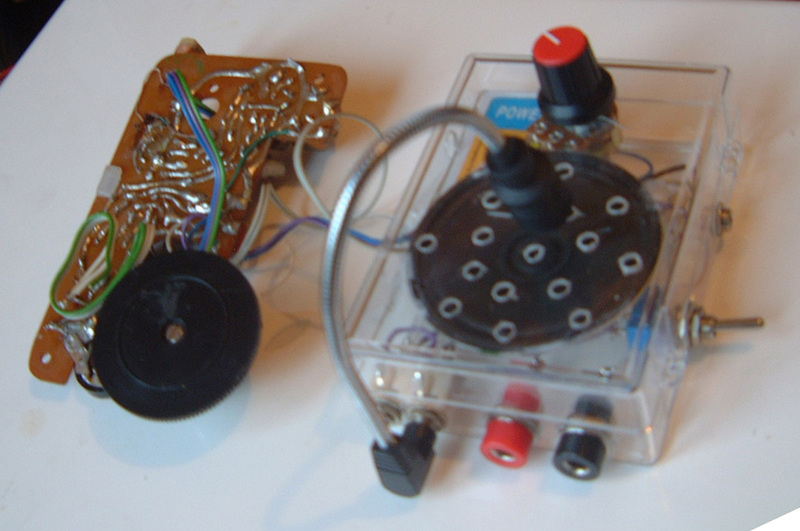 So now I had two separate sound effect circuits which differed in several ways: the Sound Machine uses samples, which are played back in their entirety, and are particularly effective when slowed down; the Sound effects module produces electronic sounds from oscillators, which can be cut off and replaced at any time by another sound, and lend themselves to being sped up. Both sections had separate pitch/speed controls; both could be controlled automatically by Bigfoot, or manually via the Stylophone keyboard. I could have stopped there, but I had another idea which I thought could be included. I believe this is known in the trade as ‘feature creep’ – just adding that one extra implementation, which then turns into two, then three . . . and eventually makes a simple circuit over-complicated. But I had just acquired a number of unwanted ‘Voice Recorder’ key rings – 100, in fact! – at a few pence each. At this price, they weren’t guaranteed to work, but when I tested some, quite a few seemed OK, and they were powered by 3 little coin cells – i.e. 4.5v, the same as the rest of the circuits in the StyloSound, so I thought I could employ a couple of them here. 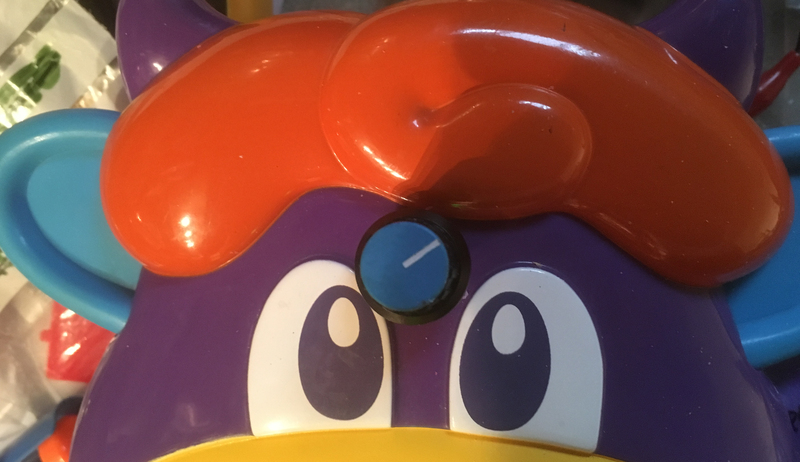 There’s a very small microphone, a Record/Play switch, a button to operate whichever of the two functions it’s switched to, and an LED to indicate that it’s recording, as opposed to playing back. I thought it would be good to be able to record a small (up to 8.2 seconds, it said) burst of sound while the samples or effects were being manipulated, then be able to play it back precisely the same again, a primitive – but undeniably inexpensive – repeat/looping device. So I added a couple of these, connected to the outputs of the Sound Machine and the Sound effect module. Small tactile switches glued to the front of the instrument replaced the ‘Record/Play’ switch and button, and I also moved the small LED’s to the front panel as well. Only one thing remained, as far as the circuit was concerned, which was the output stage. This turned out to be . . . strange. First of all, I needed to mix together the four outputs: the Sound Machine, the Sound Effects module and the two recording devices, as well as send the Sound Machine and Sound Effects module outputs to the inputs of the recorders. I planned to do this with a passive mixer – i.e. 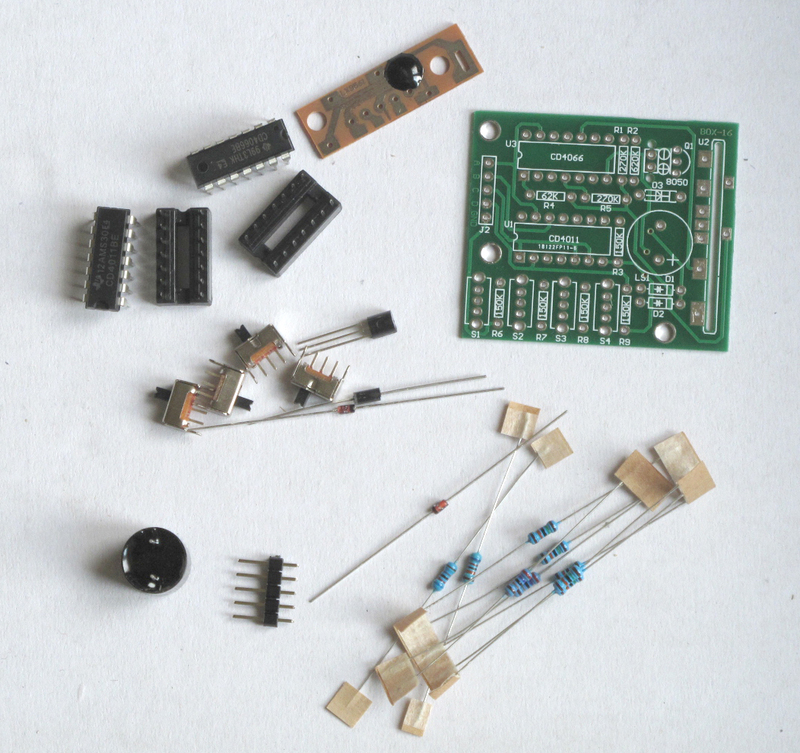 just join the outputs together with resistors. 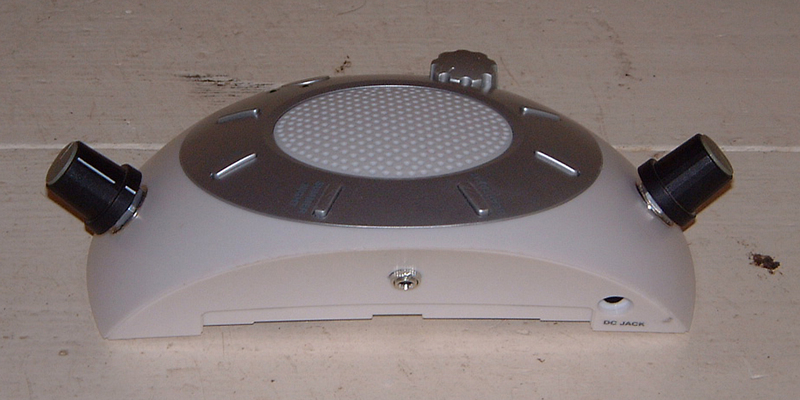 The Sound Machine worked perfectly with the internal speaker, but the Sound Effects module would only work with the other speaker terminal connected to +V rather than 0v: otherwise, it was extremely quiet. I got round this by taking the output directly from the output of the LX9561 board, as indicated in the circuit diagram above, and bypassing the output transistor. The outputs of the recorders were much too quiet, too, and the only way I could make them loud enough was to give them a path to +V by means of a very low value resistor (22Ω). The sound quality of these didn’t quite match that of the Sound Machine and Effects module – partly, no doubt, because of reduced bandwidth in the recorders – but they definitely added a useful function. In fact, I had intended to add tone and volume controls at this point, but the device refused point-blank to make any sound if anything other than a very low value resistor was put in the output path, I don’t know why. 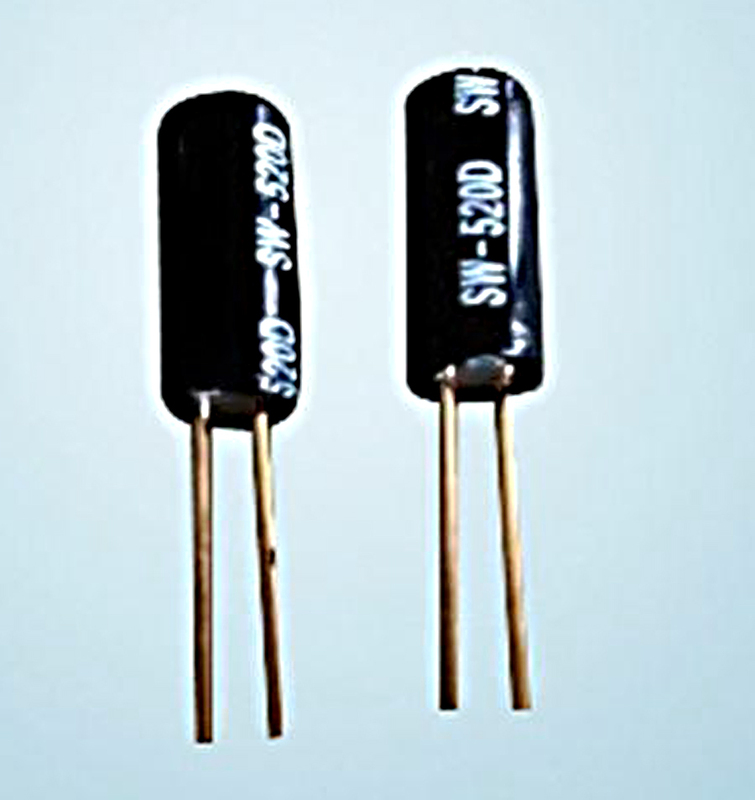 The resistors are all 22Ω, as opposed to some other equally low value, simply because I had a pile of them which were going spare. So: strange, but when I plugged it into my mixer, it sounded fine, and the volume could be adjusted there. The only thing left to do was to finish the case. 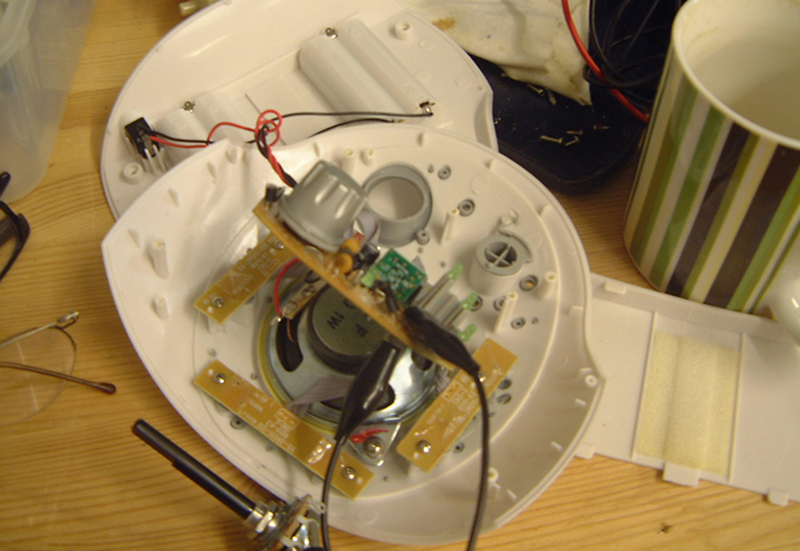 There was so much internal wiring and circuitry that the case had to be made 2.5″ deeper. I constructed sides from an offcut piece of white plastic and superglued them in place – not especially neatly, it has to be said – with a little internal bracing. After finishing the Black Widow, Mk II, I had some fun using natural sounds with it – rain, birds singing, that kind of thing. The final feature I had added to it was the ability for it to play automatically, which, though not quite as good as manipulating the samples with the Flight Controller throttle and joystick, would allow the Black Widow to keep operating, leaving the hands free to play other instruments at the same time. 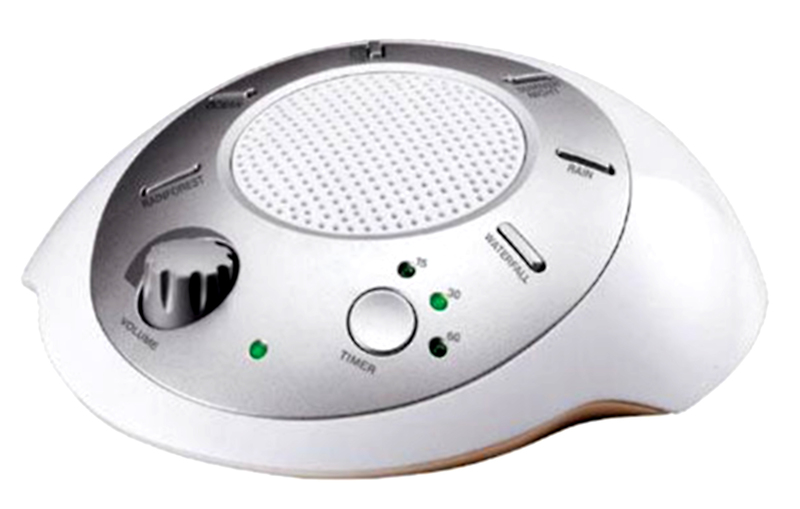 While I was thinking about natural sounds, I came across an interesting-looking device called the SoundSpa, which is designed to soothe you to sleep with sounds of nature, including rainforest, ocean, rain, waterfall and ‘summer night’. This sounded like a good candidate for some circuit-bending! These machines do appear on eBay from time to time, and I was very fortunate to get one there for three or four pounds, including a handy mains adapter. 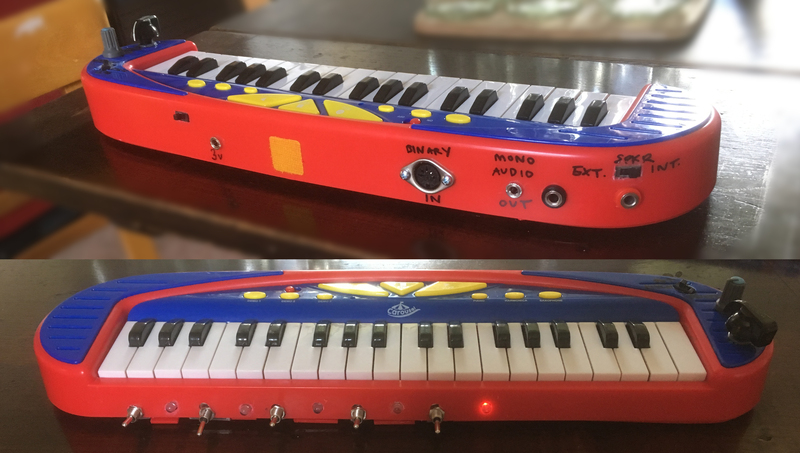 I hadn’t really done any circuit-bending, except for my work with Stylophones – like the Alien and the Hedgehog – but I described that as modification, in the sense that I knew what kind of circuit I was dealing with, and I knew more or less what I wanted to do with it. The art of circuit-bending is, by tradition and by its very nature, more experimental. 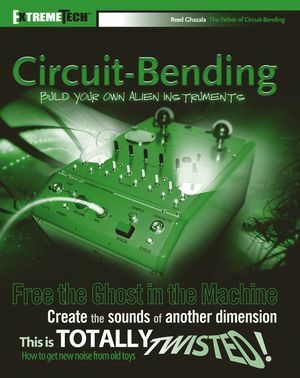 As it happened, just at this moment, I came across an ad for a circuit-bending workshop, which I decided to attend. 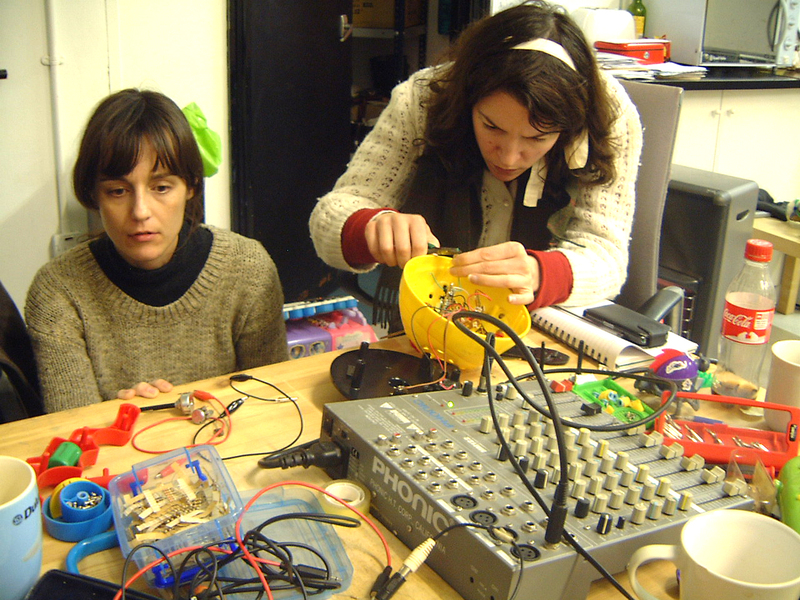 So the story of the creation of the BentSoundSpa is also the story of my day at the wonderful Music Hackspace in Cremer Street, London. 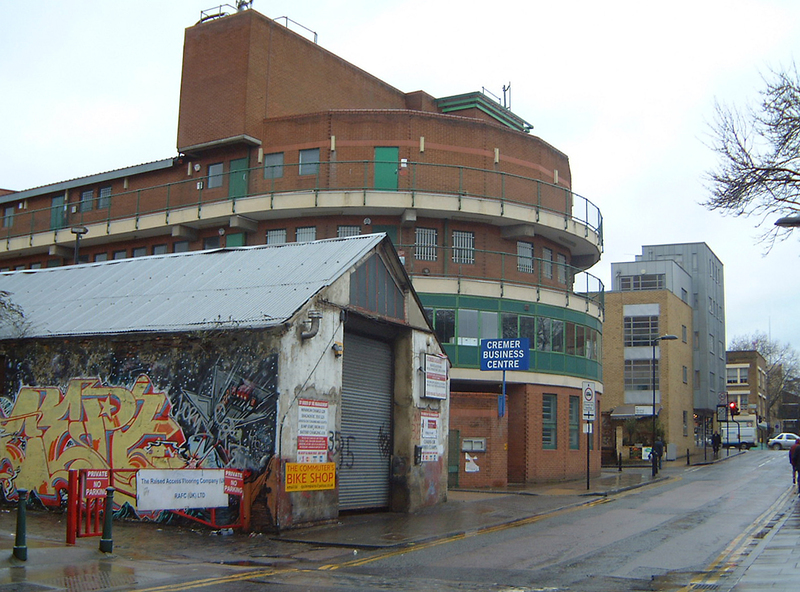 [Edit: the Music Hackspace has now moved from this location. Hopefully the link above is still working, so you can find out more about where it is and what people do there]. The workshop was organised by Susanna Garcia and run by Tasos Stamou. Tasos has created some great music, partly using circuit-bent instruments; you can read about him and hear some examples of his music on his website: http://www.tasosstamou.com and some examples of the circuit-bent instruments he uses here: http://stamouinstruments.blogspot.co.uk. There were about a dozen of us taking part, and enough musical toys to go round. I took the SoundSpa along and worked on that. 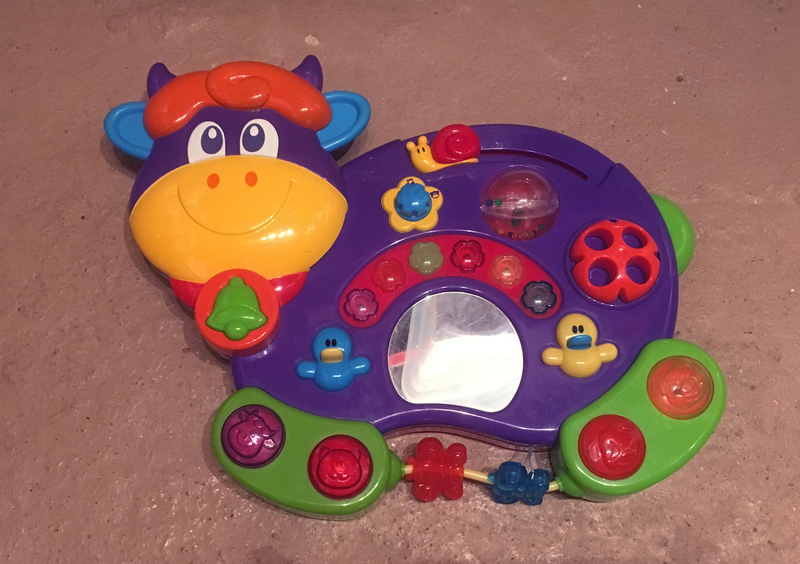 First we were encouraged to start our devices playing, take leads with crocodile clips and find connections which produced effects that were, well, interesting, unexpected, dramatic . . . all of which we did. There were glitches, repeats, jumps and crashes – but the devices seemed surprisingly resilient: when they crashed, it was just a matter of taking a battery out for a moment, putting it back, and everything would be working again. The workshop was designed to be suitable for complete newcomers – which several of us were – so we were deliberately encouraged not to speculate on what the parts of the circuits were for, and proceed by exploration. Nothing very exciting was produced by the SoundSpa until we looked specifically at making pitch changes, dabbing at resistors with a damp finger. Having found the right one, we cut it from the board and replaced it with a potentiometer. A range of values was provided, so we could pick the most suitable, and soldering irons were available to replace the crocodile clips when we were happy with our choices. I found a very high value, 2.2M, which took the pitch of the sounds right down to almost standstill. 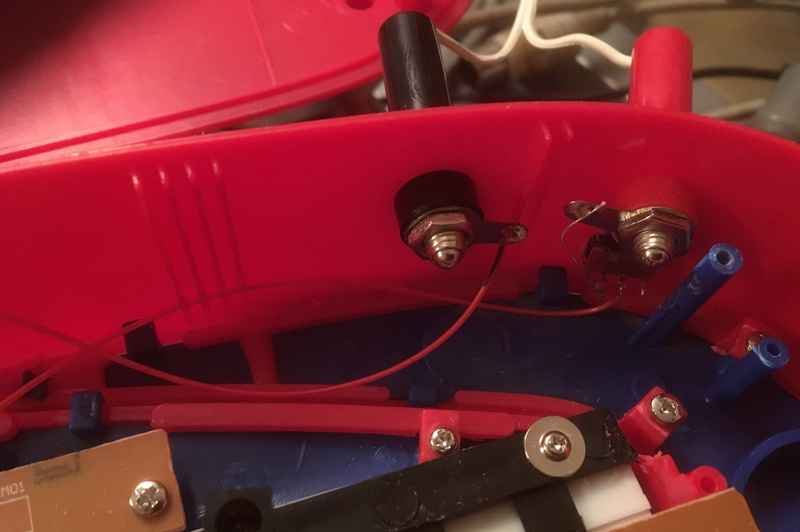 The only problem with taking the pitch up high was – just as I had experienced with the Stylophones – the resistance was so low the device crashed, so a small resistor was needed to stop this happening. I calculated this would be around 10k. On the day, I found a value high enough to prevent crashing, and when I got home I replaced this with a 10k preset, setting it just high enough to keep the device running when the potentiometer was at maximum. After this picture was taken I decided to add a second, smaller potentiometer – 100k – in series with the large one as a kind of ‘fine-tune’ control. This has a much larger effect at higher pitches when the resistance is low on the bigger one. Then, to finish, we went down to the workshop, drilled holes for the potentiometers and added a 3.5mm output socket which would cut out the speaker when plugged in. 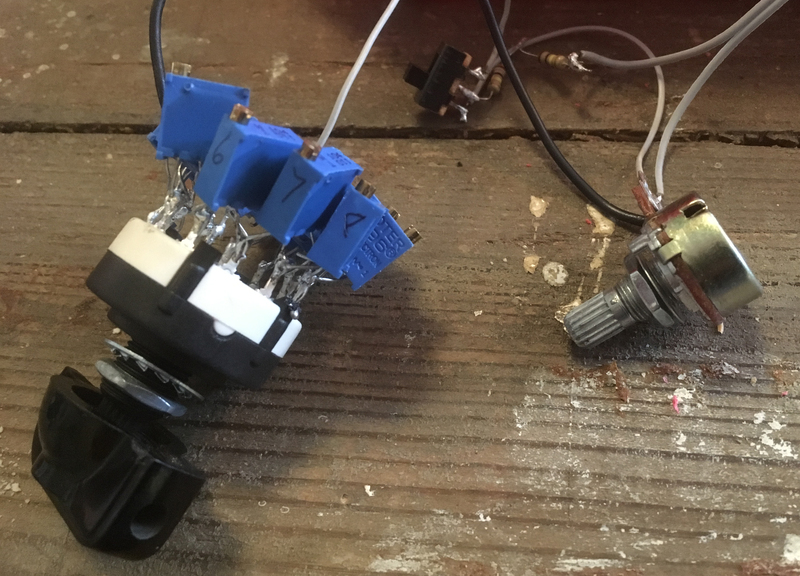 I considered replacing the original on-off switch/volume control since it was a bit dodgy – as was the one on Tasos’s example, one of several of his instruments which he brought in to show us – but it works OK with a little persuasion. Obviously, the effects available from it depend on the wide pitch and speed variations available. Like the Black Widow, the addition of a variable filter such as the StyloSim or the Active Low-pass Filter would add to its versatility. I haven’t used it properly yet, but I’ll post a sound file as soon as I have one. The Touch-Radio was, design-wise, by far my easiest project to date. This was for the simple reason that it’s essentially the circuit board out of an old transistor radio, more or less unaltered! I had had the radio for about 40 years: about 20 years ago, I took it out of its case – which has subsequently disappeared – and rewired the tuning and volume controls, evidently intending to do something with it. 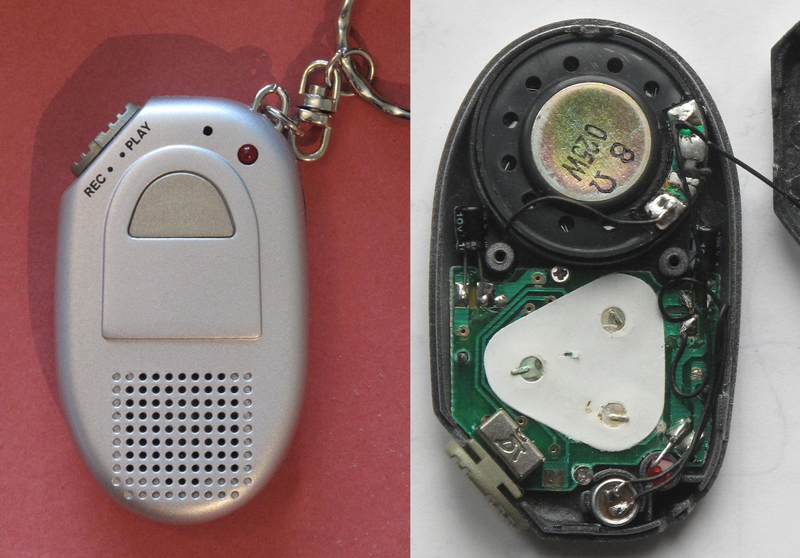 I forget now whether I ever did – probably not – but I found it again recently, just as I was finishing the Cracklephone, and thinking about touch-controlled sound-makers; so I decided to connect a battery clip and speaker and see if it made a noise. It did! And I soon discovered that by touching certain parts of the exposed circuit board interesting sounds could be coaxed out of it – often not entirely unlike the Cracklephone, but with an element of speech incorporated. Touching the aerial did frequently amplify the received radio signal, but it was rare for speech to become readily intelligible. So I decided to leave it at that! 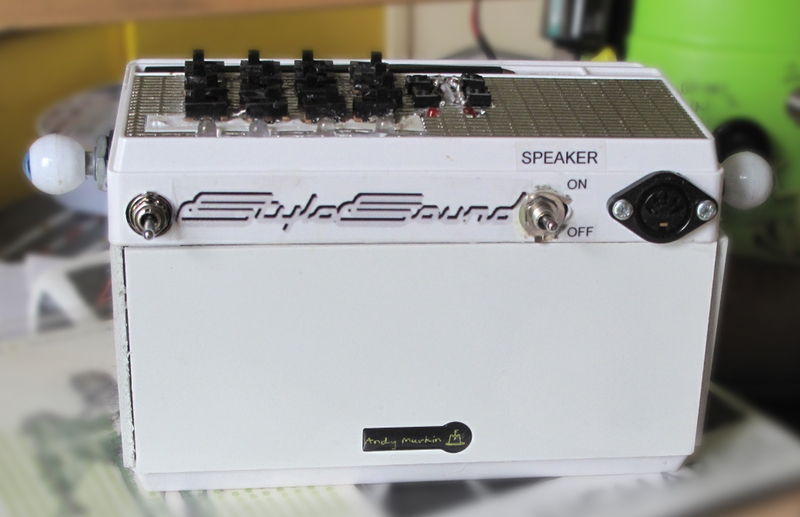 – apart from putting the speaker, volume control and power in a box, to keep it neat. A PP3 battery would just about fit inside, but it also has a socket for external power. I’d recently obtained some small plastic jewellery boxes, which looked good for small projects (some more are described elsewhere in the blog), so I used one of these. There was also room for two 3.5mm sockets and two 4mm banana sockets, which I added, as I had done for the Cracklephone, to allow a microphone to be attached to the Touch-Radio or the Touch-Radio to be connected to an external loudspeaker. I’ve always been interested in manipulating speech sounds, and have a number of projects in mind utilising radios in different ways. I haven’t started working on these yet, but the Touch-Radio is the first in the series. Circuit bending is rather nicely described in the Wikipedia (at http://en.wikipedia.org/wiki/Circuit_bending) as the ‘creative customization’ of electronic devices such as ‘low voltage, battery-powered guitar effects, children’s toys and small digital synthesizers to create new musical or visual instruments and sound generators’. The true method of approaching circuit-bending (IMHO, as they say) is experimental, without having – or without deliberately using – knowledge of the circuit you’re working on; the enjoyment of chance discovery is an important element of the experience, which is why I have distinguished it in my projects from ‘modification’, where I felt a knowledge of electronics and the circuitry being worked on was a useful thing. The guru of circuit-bending is Qubais Reed Ghazala (http://en.wikipedia.org/wiki/Reed_Ghazala), and his book Circuit-Bending : Build Your Own Alien Instruments (pub. Wiley, 2005, ISBN 978-0764588877) is the standard work on the subject. It explains how he came to discover the idea of ‘bending’ – leaving a small, battery-powered amplifier in a desk drawer, the power on and the back off, where a metal object in the drawer touched parts of the circuit and produced marvellous noises – illustrates some of the instruments he has created over the years, and gives detailed instructions on how to ‘bend’ some popular electronic instruments and toys available today. If you’re not able to obtain a copy of Reed Ghazala’s book, you can read about it on his website at www.anti-theory.com, and follow a step-by-step tutorial at www.anti-theory.com/soundart/circuitbend/cb01.html. A fabulous website for electronic music fans is www.electro-music.com; in this case a browse through their Circuit-bending forum at http://electro-music.com/forum/forum-113.html will throw up heaps of advice on what devices to get and what do with them once you’ve got them. 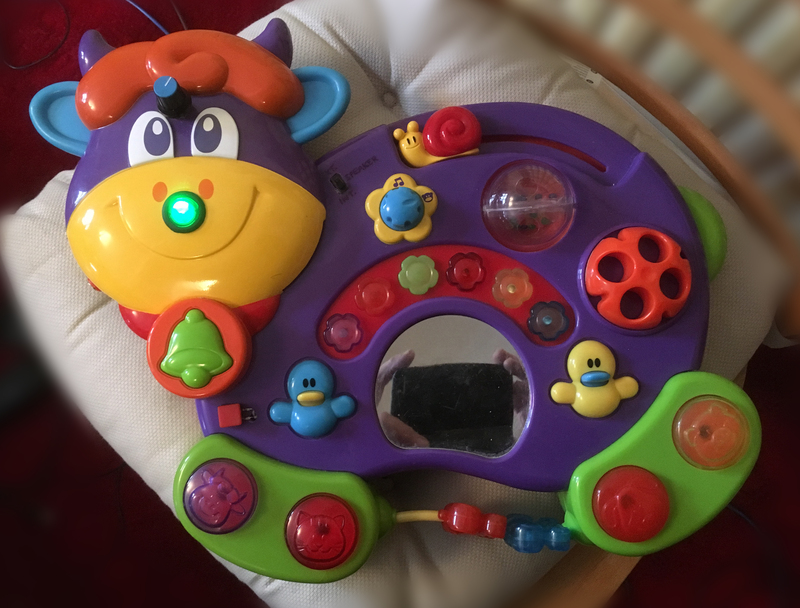 This may at the outset involve only making sure it’s using batteries, not plugged into the mains, switching it on, wetting your finger and poking the circuit board until something interesting happens. At the time of writing I haven’t begun any of my planned projects in circuit-bending, but I’ve been collecting some suitable devices to work on. I’ll report on these as soon as I’ve been able to get started; in the meantime, here are some of the items I’ve acquired. 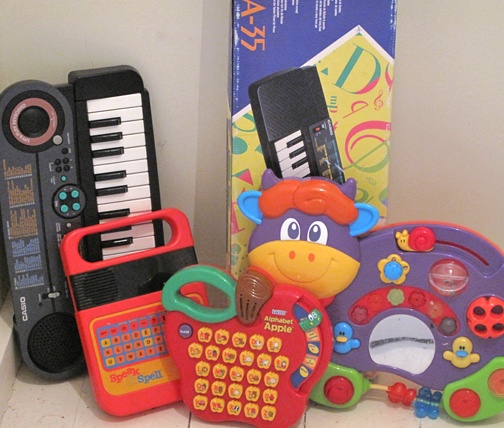 I’m particularly interested in the human voice in this context, so you will see a Texas Instruments ‘Speak and Spell’ amongst them, a Vtech ‘Alphabet Apple’ and a Casio SK-60, famous for its ‘human voice’ presets.